Great Britain, 1923: Detective Inspector John Redfrye is a blessing to the Cambridge CID. A handsome young veteran bred among the city’s educated elite, he is no stranger to the set running its esteemed colleges and universities—a society that previously seemed impenetrable to even those at the top of local law enforcement, especially with the force plagued by its own history of corruption. When Redfrye in invited to attend the annual St. Barnabas College Christmas concert in his Aunt Henrietta’s stead, he is expecting a quiet evening, though a minor scandal: Juno Proudfoot, the trumpeter of the headlining musical duo, is a woman, and a young one at that—practically unheard of in conservative academic circles. When she suffers a near-fatal fall after the close of the show, Redfrye must consider whether someone was trying to kill her. Has her musical talent, her beauty, or perhaps most importantly, her gender, provoked a dangerous criminal to act? Redfrye must seek advice from and keep an eye on an old friend to catch his man before more innocents fall victim. Fall of Angels is the series debut from bestselling author Barbara Cleverly, who is a graduate of Durham University and a former teacher who has spent her working life in Cambridgeshire, England. She is the author of 13 books in the successful Joe Sandilands and Laetitia Talbot mystery series. In this inaugural installment, Cleverly introduces an interesting new investigator to the mystery-thriller genre. A classic detective novel set in 1920s England, the story centers on the fight for women’s rights—a battle that proves to be deadly for some of those involved. 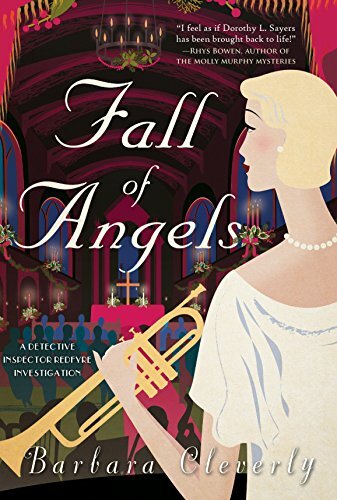 Fall of Angels has all the customary elements that devotees of Barbara Cleverly’s other writings have come to expect: excellent historical detail, humorous dialogue, intriguing characters, and a whodunit that will keep readers on the end of their seat until the very end. Her writing style is reminiscent of a bygone era that pays homage to the Golden Age of mystery writing. In Fall of Angels, Cleverly capably provides the essential historical background and prerequisite elements necessary for any successful mystery story. She always excels at weaving these fundamentals into her narratives, and this new novel is no exception to the established pattern. Although the mystery itself is sensibly conceived its plotline is not particularly unique, although this doesn’t take anything away from its general readability. Overall, it is a fine series debut that is well worth checking out.